We had a theme week for our center which included: Crazy Hat/Hair Day, Decade Day, Hippie Day, Beach Day, Cowboy/Farmer Day, Patriotic Day and more! 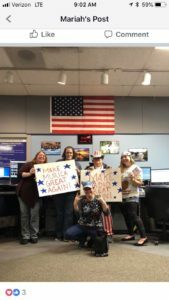 We have had treats delivered every day our dispatchers and folks have come in on all shifts to say THANK YOU for what you do. We have pictures of all the festivities.